Rice is a debatable ingredient among paleo eaters, so this one isn't 100% paleo, but whatevs. I deadlifted 253 pounds today--a new PR--and then did "Jackie" (1000m row, 50 thrusters, 30 pullups). I'm eating whatever I want, not because I "earned it" by working out but because I dare anyone to stand between me and my dinner tonight. This is one of those meals where I made it up as I went along, so I didn't really plan ahead or measure anything. First of all, I cooked up a pot of white rice. I then started two cast iron pans heating on the stove, both over medium heat. In one, I put some extra light olive oil (chosen for flavour neutrality, so use whatever oil you like), some sesame oil, and a good shot of five spice powder. In the other, I added some finely chopped garlic and some minced ginger to some more olive oil and sesame oil. While that was heating up, I cleaned and separated some baby bok choy. I threw the bok choy into the pan with the five spice powder and added a couple of tablespoons of gluten-free tamari and about 1/4 cup of water. In the other pan, I put four wild salmon fillets and let it cook on one side. While it was cooking, I stirred up the bok choy a bit. I then flipped over the salmon and added a splash of tamari to the pan. As the salmon was finishing cooking, I took a couple of deep bowls out of the cupboard and put about 3/4 cup of rice in the bottom of each, layering the bok choy on top of that. I then returned the pan from the bok choy to the stove and turned the heat up to reduce the remaining liquid into a sauce. 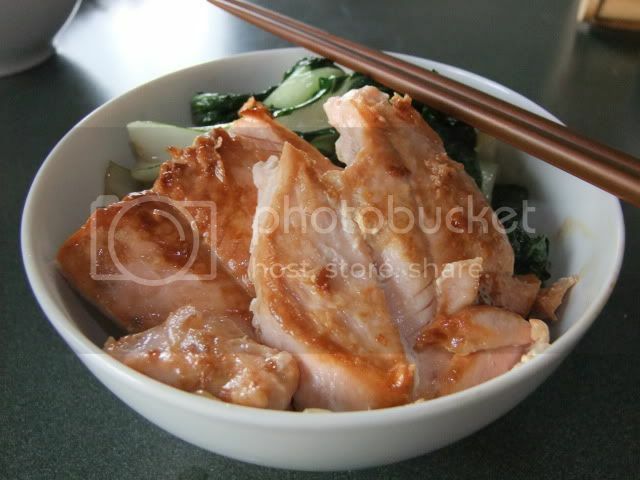 I topped each bowl with two pieces of salmon and then poured the sauce over top. This looks delicious and I see it in my near future of dinners.